At the end of last week, my follower counter clicked over to three digits. I am thrilled! I started this blog with very low expectations, and it has quickly become a big part of my life. I love blogging, and I hope to continue bringing you lots of projects, printables, and ideas. I know you have lots of options when it comes to the blogs that you read, so I thank you sincerely for choosing mine as one that you regularly visit. 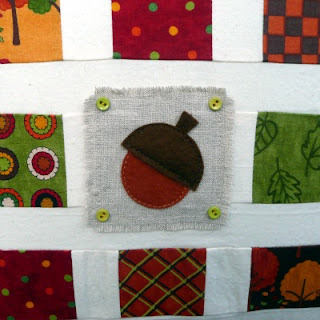 If you haven't seen my Acorn Patch Pillow yet, you can check out the nitty-gritty details HERE. I love this pillow, and it almost breaks my heart to give it away, but you guys deserve it! 1. Since this is a giveaway to thank my followers, you must be a follower of my blog to enter, but new followers can enter, too! Just become a follower before entering the giveaway. 2. There's only one way for my followers to enter... Leave one comment on this post. It's that easy! Only one comment per person please. 3. 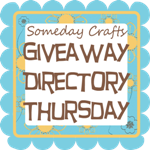 The giveaway will close at 8:00am (EST) on Monday, October 25, 2010. 4. I will use a random number generator to determine the winner by comment number. 5. I will notify the winner via email. Please make sure your email is available to me through your Blogger profile or leave it in your comment. If I am unable to reach the winner by 8:00am (EST) on Thursday, October 28, 2010, I will choose another winner. Thank you all so much for following Gwenny Penny. It feels so good to have found a group of people who are interested in and like what I do, and I really appreciate that. Good luck! Yea, I'd love to win the pillow. It is beautiful and would look perfect on my new furniture in my sunroom! Oh, I LOVE this pillow - especially the acorn and button detailing in the center! I've been a follower for a while now and would love to win this! Congrats on 100! I'm a little bit in love with this pillow, I really hope I can win it! beautiful. i hope i win! I'm a follower and fan! :) Love this pillow. I have the perfect spot for it. Wow! That's a generous giveaway! I'd have a hard time parting with it, too. Just know that if I win, I'll give it a loving home. Congratulations on 100!! This is a beautiful pillow! If I don't win it I'm going to try to make it. Thank you for the giveaway opportunity! I have been following you for awhile. That pillow is adorable! so happy to follow you sweet blog!you have so many wonderful projects to share.I just loved the hair clip kit I was so lucky to have won. I still can't believe you are giving this creation away! Would love to win!! & of course a follower. What a sweet fun fall creation! 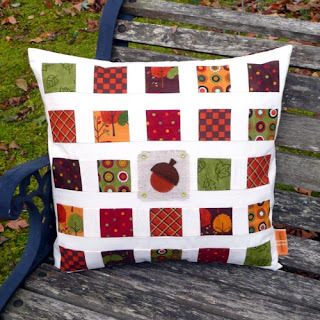 I love all things fall and I love pillows and I love quilts and I love creativity and I am now a follower!!! Love your blog too! Congratulations Gwen! I'm so excited for you. I really appreciate all the sweet comments you have left over on my blog! You are a darling and I hope you have all the success you could dream with this terrific blog! What a beautiful pillow! I would set it out year after year. Very nice! Congrats on all of your followers - I just became one too! Thank you for the chance to win the pillow. It's beautiful and so nicely made! I just stumbled on your blog and now a follower. Fall is my favorite time of year, but in Florida is stays mostly summer year around :>). Would be honored to win your georgous pillow. Love what you did with the center motif. Just joined...and am so tickled to have found your blog. Thanks for the giveaway! The acorn pillow is adorable ! My little grandaughters have been collecting acorns like crazy this Fall. Love to win it ! New follower....I love pillows! This one is super cute! I am a new follower - enjoyed reading your blog. The pillow is beautiful! Thanks for the generous giveaway. I love the acorns and the colors are perfect!! My daughter picked up the biggest acorns I have ever seen this weekend they are now in her 'treasure box'!!! I love the pillow! It's beautiful. I'm a new follower to your blog, via GFC. I'm your newest follower. Great pillow! It looks like it took a long time! Great job!! I would LOVE to win this, it's so stinkin' cute and since sewing is not my specialty it's probably the only way I'll have such a sweet little pillow to add to my couch. It's great that's perfect to put out all season long. Congratulations on 100 followers!! Your crafts are always to creative. Amazing Gwen :)Incredible talent. Lovely pillow! Thanks so much for the chance to win! That's so pretty! I came over via Tatertots and Jello, via the linky. I've been wanting to try a quilting project and this one looks do-able for me. Thanks for sharing it, both in the photos and giving it away. Love this pillow! Very cute! I came across your blog when you were featured on The Idea Room and I am glad I did. I love your blog....you have such great ideas! 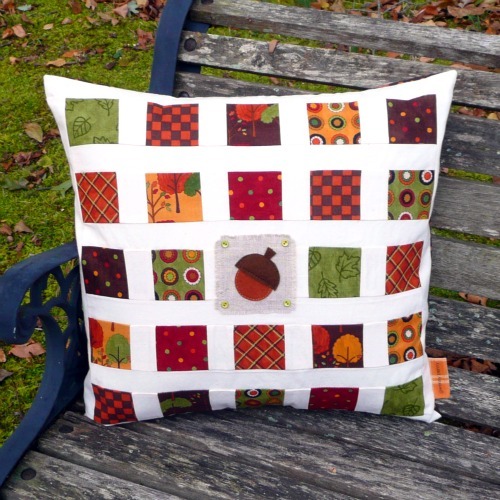 I would love to win the acorn pillow...it is so cute! Thanks for the opportunity. How did I miss this acorn-cuteness? I'm a follower!! !